2into3’s Quarterly Recruitment Monitor has shown that there has been an 8% increase in management roles advertised in the not-for-profit sector in Q1 2018 compared to Q1 2017. Fundraising and commercial roles were the most popular in Q1 with finance roles doubling on Q4 2017, while HR roles advertised have also increased. The full report can be found here. 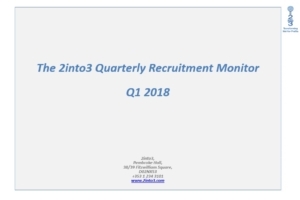 The 2into3 Quarterly Recruitment Monitor tracks trends and provides insight on management level recruitment in the not-for-profit sector on a quarterly basis. For further information on 2into3’s recruitment services and talent strategy development process please feel free to contact 2into3 Director Dennis O’Connor at Dennis@2into3.com/ 01 2343184 or 2into3 Recruitment Coordinator Adrian McCarthy at Adrian.mccarthy@2into3.com/ 01 2343135.